Monsters of Men by Patrick Ness is 600 pages long. It seems a trend in YA literature-longer and longer books and more and more series. I was anxiously awaiting this tome, as I was fascinated by the first two books in the Chaos Walking trilogy. Though the story has been extremely violent, the characters are wonderful examples of the foibles of men and humankind. 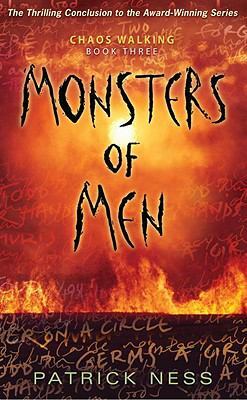 In Monsters of Men, the story is told from the perspective of three voices. Sometimes I got confused who was talking because the change in voices was so quick sometimes every two pages or so. I wanted there to be peace, and I kept reading each suspenseful turn of events to find out if the story ends in a way that I hoped. I am not going to give any spoilers here, but this is a sci fi story that resonates with me long after I have finished reading it. If you are a fan of dystopian literature this may be a series for you.